Peter Hickman will head to Brands Hatch for round two of the MCE British Superbike championship over the Easter weekend. Action will unfold on the short and technical Indy circuit. Having celebrated his 30th birthday last week, Hicky is hoping for a belated present by recording a brace of top results to add to his points tally and maintain his sixth place on the leaderboard. The new Smiths Racing BMW is proving to be extremely competitive and Hickman realises the need to record a good qualifying position at Brands Hatch as grid positions can be the deciding factor on the Indy circuit which has few easy passing places. 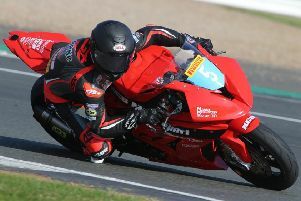 He will be aiming his sights at a podium finish and having recorded a fourth place in the first race at Donington Park is not too far away from his goal. The weekend at Brands Hatch begins on Saturday with two free practice sessions, the first at 11.05am followed by a second at 3.20pm. There is a third free practice on Sunday at 10.45am prior to the three-stage qualifying session which is scheduled for 2.32pm. This will set the grid for race one on Sunday. The short morning warm-up on Monday at 9.40am gives the riders a chance to make final preparations for the opening 30-lap race at 1.30pm. The second race is due on track at 4.30pm.